If you’re looking to increase your overall equity, you should be concerned about current savings interest rates. You earn money from savings accounts just from having your money sit there, but the rates are different from one bank to another. 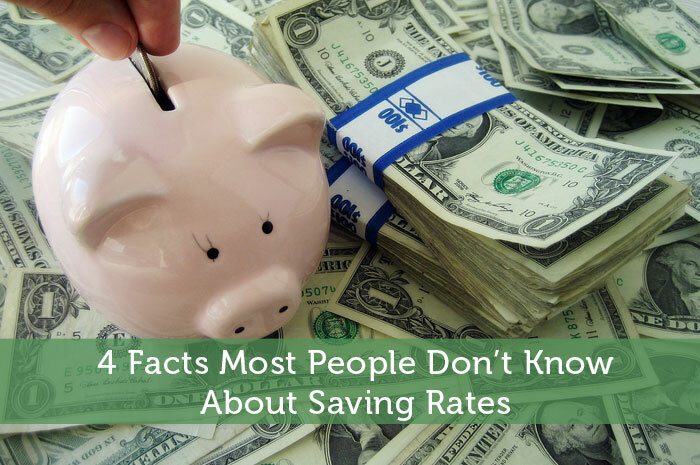 So, here are four facts that most people don’t know about saving rates and how to effectively save money. Online banks don’t have the same overhead as traditional brick and mortar banks which means they can offer higher interest rates to their patrons. If you never physically go to your bank, you might as well take advantage of online banks. You still get customer service, banking options, and pretty much everything else offered by traditional banks. The only thing that is missing is the face-to-face interaction. Compare the current savings interest rates for yourself to see what online banks can do for you. People put money into CDs because they are safe and they offer better interest rates than most standard savings accounts. However, most people don’t know that you can sometimes find savings accounts with higher rates than CDs, just look at the current savings interest rates and compare them from one bank to another. You can find a savings account with an interest rate as high as 0.8%. Most CDs only offer rates that high if you’re willing to leave your money in for two years or more. Why not put your money someplace you can access it whenever you want? Some banks offer you higher interest rates when you open a savings account, but then they put restrictions on the amount of money you can withdraw in one transaction or over a period of time. This can be a problem if you want to use all of that money on a big purchase. So, be sure to look at the terms carefully when the saving rates are above the national average. It might be because you are submitting to withdrawal restrictions that can make it hard to get your money when you need it. Many people are attracted by high interest savings accounts because they think they are going to make a significant amount of more money than their previous savings account. This is true for some people, but not for people with low balances. For instance, if you typically make $2 per year in interest and you switch over to a high interest savings account, you might make $4 per year instead. That’s not enough incentive to switch. However, if your balance is in the thousands of dollars range, you’ll see bigger numbers. As you can see, you can use saving rates to your advantage, but you need to have a good chunk of money before you see big interest deposited in your account. If you start with a small money investment, the process of building equity through interest will be slow going. Interest are so low right now, every little bit of interest is good to take. I prefer online banking anyway, think I would stick to it even if rates were lower for the convenience of e-banking. I’m happy with the online banking features of my regular bank. I admit I do overlook the difference in interest rates since they are rather low either way. I only bank these days because of the convenience of online banking. The interest rates are so low that it is better to keep your money instead of depositing it to a bank. Oh well, you can invest in a more investment though like Equity or something in a bank to earn more. I recently switched to an online savings account for my business income. In the first month, I made 25 cents in interest! Good thing that the interest rate wasn’t the reason behind the switch. Personally I just try not to keep my business income as cash for long enough to worry about whether it is getting a quarter of a percent higher interest or not. Interest rates have been kept low, so even with better than average returns it will still take a long time to make good passive income from bank accounts. Where the real benefit is, is in low credit card interest rates…this can help you save $1000s of dollars over the course of a year. Thanks for pointing that out Alex…the low credit card interest rates are quite attractive and can save one a pretty sum over time! Interest rates are so low right now I would try to put your money in just about anything else… investing in the stock market, your education, real estate, starting your own business, etc. Exactly…it’s just not worth leaving money in a bank account for long as it’s just losing money to inflation. I’m personally focusing on real estate for now, but will soon be switching my focus to some stock market investing. Plus I always try to invest some money back into my blog. great tips – this is really educational for me haha. Can you do an article comparing the rates of various banks? I’m not sure how useful such an article would be since it would be quickly outdated. Online savings accounts have some great rates and most times better than your average CD however some online banks such as Ally have excessive transaction fees that will charge you $10 if you use the account to much. Yes you do have to be careful of extra fees that you might not expect. There is sometimes reasons why a company can offer better interest rates. With the interest rates as low as they are at the present moment, any advice on saving to get more interest is so welcome. Great tips and very useful advice. Most people, me included, often overlook interest rates and such stuff, especially when we have set patterns of saving or when being associated with a particular bank, we don’t want to change that. Yes, online savings accounts do come with better interest rates. And online banking is a far more convenient way of banking than the regular ones. I like you last point and agree with it completely. More the amount of money in the savings account, it will get that much more interest. Great tips, Jeremy. I *always* learn something from reading your entries. So grateful.